Come here for a slice of concentrated Cannaregio: open, uncluttered, a hodgepodge of styles, a shadowy portico, a wide and straight canal, all a bit down at heel. In its day the Misericordia church (or Santa Maria di Valverde—the original name of its island) and abbey was the parish of the youngest of the six scuole grandi; the now deconsecrated church, founded in the 10th century, was rebuilt in the 13th. During the Black Death in 1348, all the monks in the abbey died. In 1651, it was given an inoffensive Baroque façade by Clemente Moli, a follower of Bernini, with a bust of the philosopher Gasparo Moro (who paid for it) over the door. It’s the kind of bland façade that would help people forget the murder that took place here in the 18th century, when a jealous priest slipped a poet a poisoned host after he caught him with his mistress. 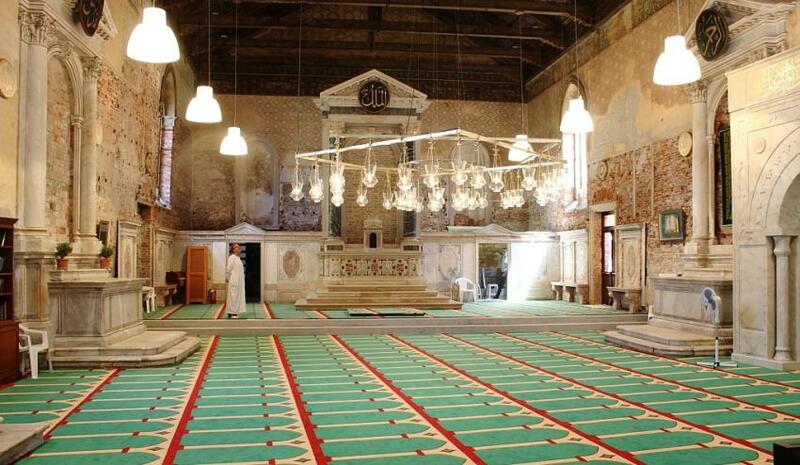 For the 2015 Biennale, the church interior was transformed by Icelandic artist Christoph Büchel into 'The Mosque', a work questioning religious boundaries and controversies over the construction of mosques in the West (Venice, in spite of its close trading relationship with Muslim communities over the centuries, has never had one). 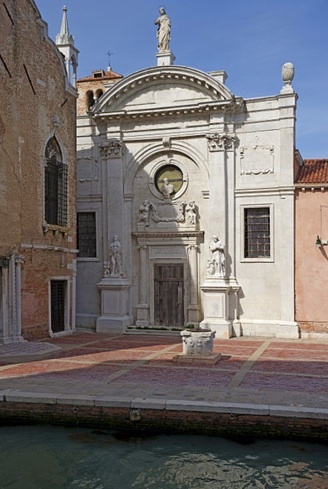 Local Muslims (there are some 20,000 in Greater Venice region) were delighted to finally have a place to worship: 130 showed up for Friday prayers, but the police immediately closed it down, claiming the organizers had not received proper permission for a religious site. Next to the church is the Gothic Scuola Vecchia della Misericordia, built in 1308 with a pair of white rabbit-ear pinnacles and a curved crown roof. Most of its ornate, canopied doorway by Bartolomeo Bon is in the Victoria and Albert Museum, although two angels and an inscription survive in the architrave. When the Confraternity moved to its new quarters, this building was given to the guild of silk weavers. If it’s open (no set hours), you can see the old cloister between the church and Scuola; the whole complex is now used as an art restoration centre and may soon be restored itself. A wooden bridge to Campo dell’ Abbazia crosses over to the Fondamenta della Misericordia, address of the Scuola Nuova della Misericordia, a large building designed by Sansovino in 1534, its interior finished fifty years later, but the façade still lacking its costly marble sheathing. Its grand Renaissance salons were long home to an athletic association; not content with gobbling rebounds off the side of San Marziale, the local sportsmen were on the verge of turning Sansovino’s huge main hall into a basketball arena. Of late it has been decided to restore it and put it to good use, and there's a competition for the most useful project. Nearby don't miss the Ponte dei Chiodo, spanning the Rio di San Felice and the last surviving bridge in Venice without parapets. The Misericordia complex appears in a speedboat scene in Moonraker, and at the end of Summertime, and as the place where vampire Klaus Kinski in Vampire in Venice (1986) enjoys a grisly meal.